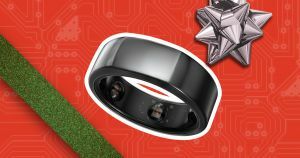 If there’s a tech-savvy, health-conscience friend on your holiday gift list, the Oura smart ring is a great option. At first glance, the Oura might sound like a glorified mood ring. But this advanced wearable is so much more than that. It contains high-tech equipment including an infrared optical sensor, a 3D accelerometer, a gyroscope, and temperature gauge. All of these features combine to track your body’s movement, temperature, pulse, and other metrics to create a personalized baseline. That data is then used to recommend optimal times for users to exercise, eat, and take breaks throughout the day in order to promote restorative sleep at night. The information can also be used to improve mental, cognitive, and physical performance. And as an added bonus, you can use the promo code “Futurism” at check out to get $50 off your Oura ring purchase.